The preferred method of fixing a flat tubeless tire is to dismount the tire and have a professional fix it. But when an emergency arises, you might want to have the Stop & Go Tire Plugger on hand. It’s a tire repair kit that allows you to make a repair without dismounting the tire. The kit includes a spring-loaded gun that drives a mushroom-shaped rubber plug into the hole. The shaft of the plug expands under pressure to fill the puncture. The mushroom head of the plug seats on the inner wall so that the puncture is sealed from the inside, preventing any air from escaping. Fix the tire, inflate it with a portable air compressor, and you can be back on the road. The kit comes in a hard-sided case and includes a plug gun, nozzle, probe tool, T-handle reamer/rasp tool, retractable blade, rubber mushroom plugs and detailed instructions. 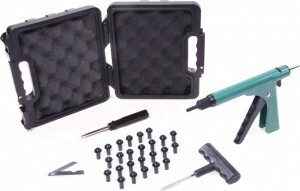 The kit carries a suggested retail price of $49.95 and is available at stopngo.com. Having a kit like this is very important when you experience a flat tire on the road. This could help in fixing the flat tire faster so you could be back in the road right away. Being knowledgeable on how to fix your car is a great advantage if you’re a car owner.